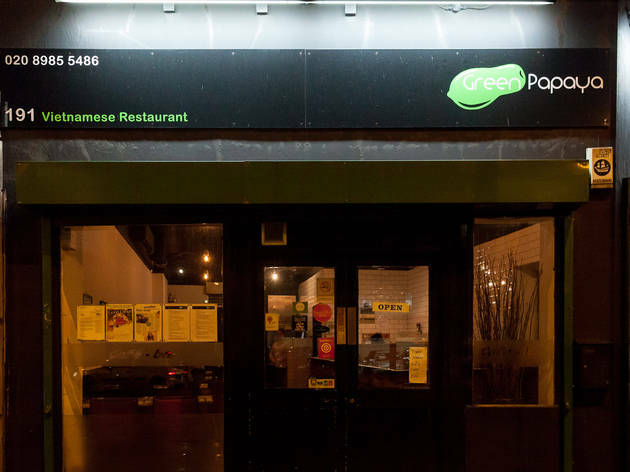 Located halfway down Mare Street behind an apparently run-down façade, Green Papaya feels like a quiet club. 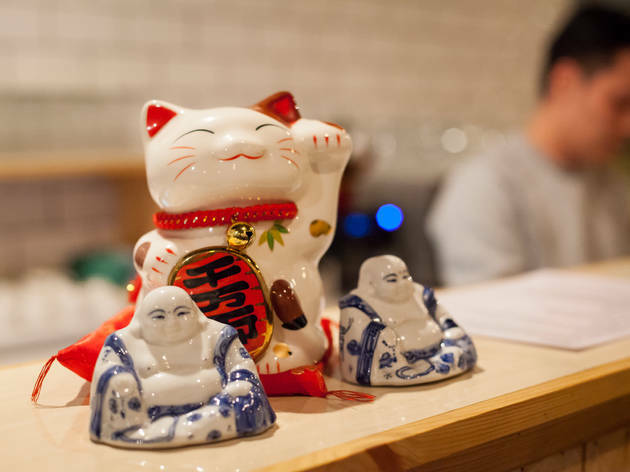 It’s a charming little place: long-established, family-run, simple and well loved. Customers are a mixed bunch, from American hipster tourists to dapper older-generation Caribbean couples in their Sunday best, complete with hats. 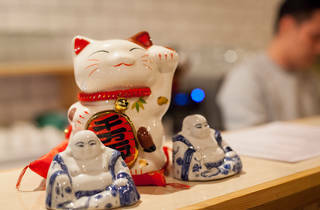 Service is laid-back yet efficient and welcoming, and the food quite superb. Soft-shell crab with salt and chilli was exactly as it should be, with discernible chunks of flavoursome, well-textured crab in a crunchy, tasty batter. 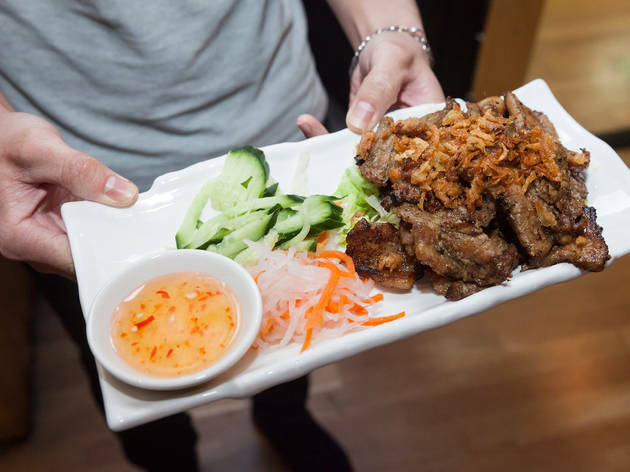 The food here seems to come from a slightly different tradition from that of most London competitors: grilled spicy lamb with cumin, a rarity on most Vietnamese menus, was a revelation – the flavour of the lamb highlighted rather than masked by the treatment. Lamb slow-cooked with lemongrass, galangal and coconut milk is an enticing alternative. 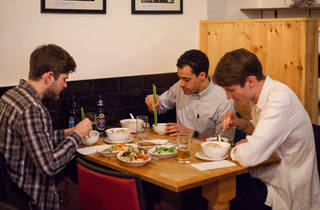 Another plus: prices are generally 20% lower than those in the other well-known Mare Street Vietnamese establishments. Still the best Vietnamese in my book. The beef wrapped in betel leaf and the grilled belly pork are winners everytime. Bland, bland food. I can't for the life of me understand why anyone would rate the food so well. This is where I come to think "thank God I know good food as a NYer and it's not this." My friend and I went here last night based on previous positive reviews. 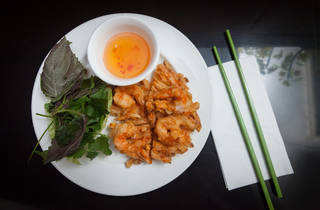 We started with the summer rolls, which were fresh and decent, served with a small bowl of sauce. She ordered the red curry with chicken but was served the green curry instead. I got the stir fry pawns with tamarind sauce and sweet basil, although I was tempted by the baked salmon in banana leaf. Well.... maybe I should have gotten that instead. My friend said the chicken was too chewy and isn't a fan of green curry that much. Like my dish, she said the overall flavour was lacking. My dish was sweet with the tamarind... but that's about it. Overall flavourless. We got served straight away and it was relatively uncrowded at that point (6:20 pm.) It got more crowded as the night wore on. Won't be returning. I'll wait to return to NY for amazing Thai food. 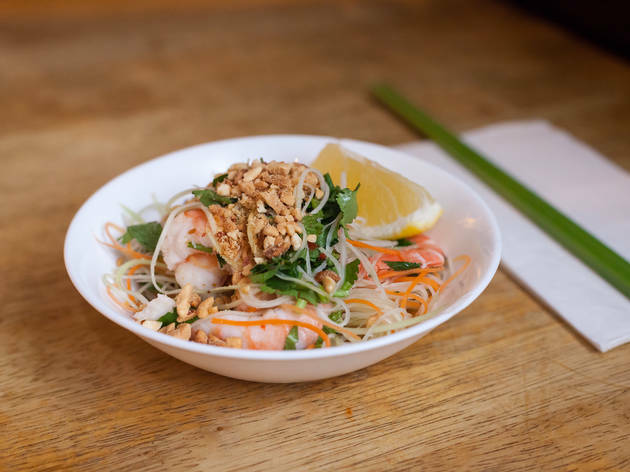 I recently picked up some takeaway from Green Papaya, after reading about it Timeout’s article about Mare Street, and it was absolutely delicious! For £20 we were able to get a starter, two mains and a side of rice which I thought was quite good considering the quality and portions of the food. The spring rolls were still nice and crispy by the time we got home and my tofu and aubergine in black bean sauce had a great flavour and was not too heavy. My boyfriend had the bbq lamb which he said was some of the best lamb dishes he’s had. The restaurant also looks like quite nice if you were to come for a sit down meal and the staff were very friendly. We will definitely be ordering from here again. Went to Green Papaya on Saturday and the food and service was great. Such good value too. I definitely recommend visiting. just by our cab office nice place worth a try you will love it we been there. The interior was refurbished to a nice airy and clean space! Had lamb and that was great. One of the better places to go around here. Excellent service and delicious food! 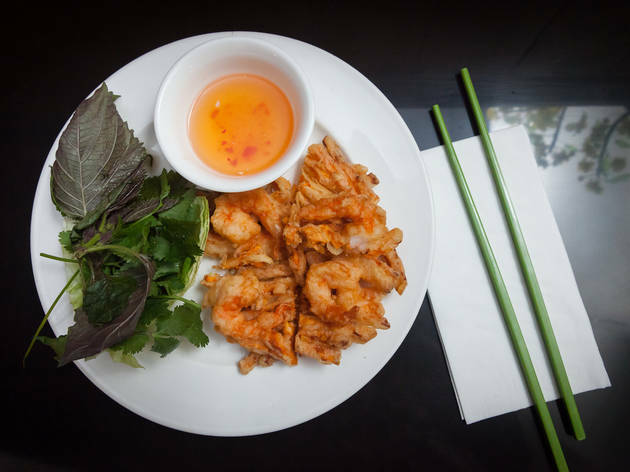 It was our first experience in a vietnamese so we asked the waiter to help us - and we really appreciated his suggestions. very recommended - but remember to book your table. We felt compelled to write a review which we rarely do, we have just eaten at Papaya and are sorely disappointed based on the reviews below. Starters started out okay, the squid is okay far better at other places, the papaya salad lacked flavour and the prawn/sweet potato starter is expensive considering for over £6 you only get 4 prawns, it tasted okay if a little bland. The main however was awful, beef with lemongrass, no flavour, cheap old meat which was congealed and very grumpy service. We would not go back or recommend! So wanted it to be good. Food and service is excellent (have been about 10 times). 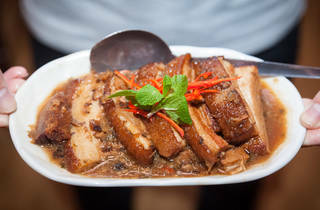 My favourite dishes are the crispy squid with purple basil sauce, and the hanoi beef. Absolutely smash it every time! The best Summer Rolls around, the Calamare was pretty special too. Staff seemed a little cold and we felt a bit rushed but the food was superb. 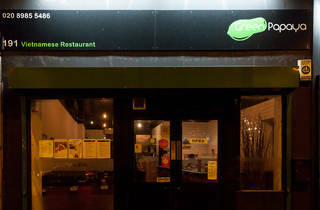 Totally disagree with the Time Out review - I have been going to Green Papaya regularly for the last 3 years and have never once had a bad meal. Yes, some of the specials DO stay the same - but I LOVE the winged bean salad and the Barbeque pork belly so why on earth does it matter?! 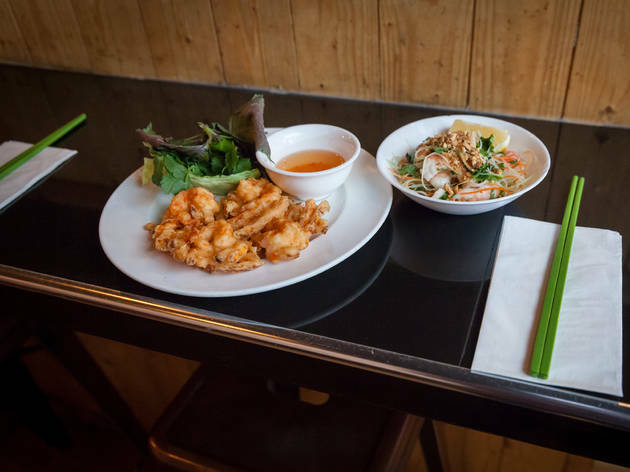 Bahn Tom, Spicy Rare Beef salad, Banana Flower Salad and any squid starters are all fab - fresh, lightly battered with no oil or grease. 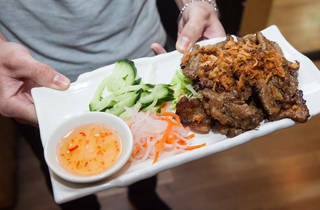 An Old favourite from the spcails was the Deep Fried Pork Fillet - crispy, spicy and to die for! If you are concerned stil - dont take my word for it, simply drive past any week night (apart from Mondays they are closed) and you will see its not just me that adores this place! 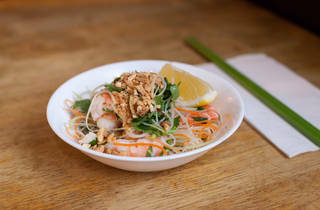 Best Vietnamese by far - go for the papaya salad and bang Tom to start (sweet potato and king prawn). Don't agree with time out review at all. I love Green Papaya, and can't see how Time Out can give it a measly two stars. The salt and pepper squid with purple basil dressing is amazing and I've never had a bad meal here, whether it's sitting in, or taking away. 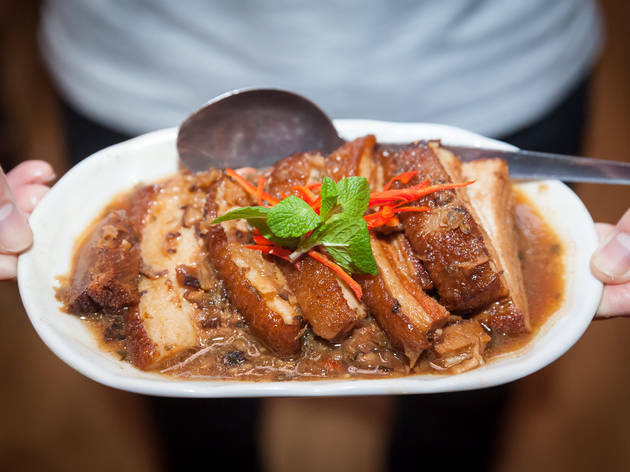 The food is always a high standard and yes, there aren't many 'specials' but when the menu is as bountiful as Green Papaya's is, there's not much need! 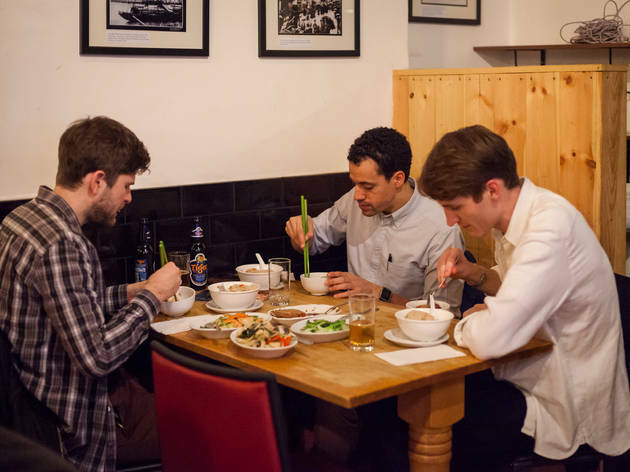 Compared to the likes of Tay Do or Loong Kee on Mare Street, the food's better and the environment more local and friendly. 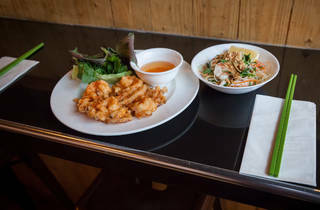 Green Papaya is my favourite restaurant in London. I've been coming here for years and I've never had any thing less than a fantastic meal. Very disappointed to hear the review above, don't believe it, anyway Kingsland road is trendy and all that, but this place is where I love to come and will continue to come to.